What can you do with $10 in America? We can do MUCH more in Ukraine with $10! $10 = a ten day course of massage for a child! Imagine the results that YOUR $10 can have for one child in Ukraine! $180 will train a caring person to become a massage therapist! Imagine the influence that $180 will have on an orphanage, a village, a family. We have three people wanting to become massage therapists in two villages. They need financial assistance to take the three month training course. In return, they will give massage therapy to MUCH children for twenty hours a month for nine months for free. They will also give massage therapy to MUCH children for twenty hours a month, receiving the payment of $1 per hour from MUCH. The general course of massage therapy is ten days. 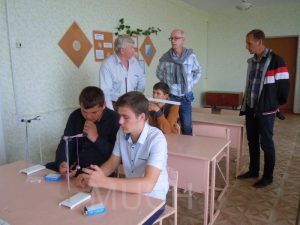 Yura, in the red, white, and blue jacket, is a pastor in the village of Shostakova. He and his wife manage our projects with the village school. Yura is very interested in learning massage therapy and working with the special needs children in Shostakova and the surrounding villages. At the Stepovoye orphanage, there are two staff members who want to become massage therapists. The need is great for these children. You can help these two staff increase their professional care for these boys. 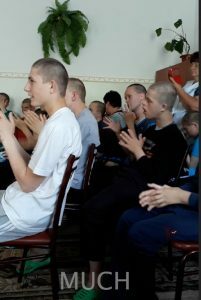 Last week, together with our pastor and members of our church, we visited an Stepovoye orphanage/boarding school for boys with disabilities, our second visit. When children of different ages entered the hall, we were moved to see how the boys who could walk normally supported other children who could not walk without support. Our hearts were full of tears and compassion for these children. We were moved to see their concern for each other, friendliness, and trusting faces. Many of these children are left here by their parents because of their disability. Many parents cannot take care of their children with disabilities because of financial need. We had a wonderful opportunity to hold the children’s hands, tousle their hair, and look into their eyes. How necessary it is for these children to receive massage therapy! Massage affects the body in a number of ways. Here are three. First, mechanical action results in better circulation of the blood and lymph systems. This is necessary to prevent bedsores in children who spend their days in a wheelchair or in bed. The second effect is a neural-reflex action. Parts of the body do not function on their own due to injury to the brain. Massage stimulates the end receptors, sending the signal to the brain. As the repetition deepens the signal pathway, embedding the process in the brain, the signal can be initiated from the brain. The third effect of massage is a humoral-hormonal effect. This effects the digestive system, releasing endorphins, creating pleasure and improving the operation of the digestive system. All massage therapists of our mission touch the children not only with hands, giving them massage, but the most important thing is that they touch them with love. Love is from God. In the orphanage in Dobromel, 11-year-old Yulia has received two courses of massage. Natasha, our massage therapist, already sees excellent results. The girl had insufficient clarity of basic movements, incorrect walking gait, weak regulation of muscular movements, difficulties of independent performance of motor exercises, low level of orientation in the environment, slow memory, and fuzzy speech. Thanks to massage, the reflex excitability of muscles decreased, blood circulation and lymph flow improved, and the child developed positive emotional interaction with the other children. She began to stutter less and increased her vocabulary. She has improved speech and thought processes. At the Veleeky Luben orphanage, ten-year-old Ivan is diagnosed with autism. After several courses of massage, Ivan’s results were blossoming like a flower. Last year, when the boy was brought for his first massage, he did not want to undress and did not allow anyone to touch him. Thanks to his love for children and his professionalism, Igor, the MUCH massage therapist, helped this child change, and open himself to the love of those around him. We observe how varied types of massage affects children according to their needs. We are so amazed and happy to see how these children are changing, thanks to the massage program of the MUCH mission! How necessary it is for these children to receive massage! Change Ukraine a little bit at a time! This entry was posted in Massage for children with disabilitiees, Special needs children and tagged Massage affects the body on June 7, 2018 by Sveta Koehler.